If we have identified that a sawmill’s sales average is not as good as its competitors and peer group, the next step is to ask “why?” To make improvements in the subsequent step, it is imperative to identify the underlying cause(s) of the current performance challenges, and then determine what can be done to affect change and ultimately improve profitability. When it comes to average lumber selling value (“sales average”) at a sawmill, the two biggest drivers are the mix of product sizes being manufactured and the grade yield or mix of different grades. The chart above allows us to analyze average lumber selling values and the mix of product sizes compared to other sawmills. 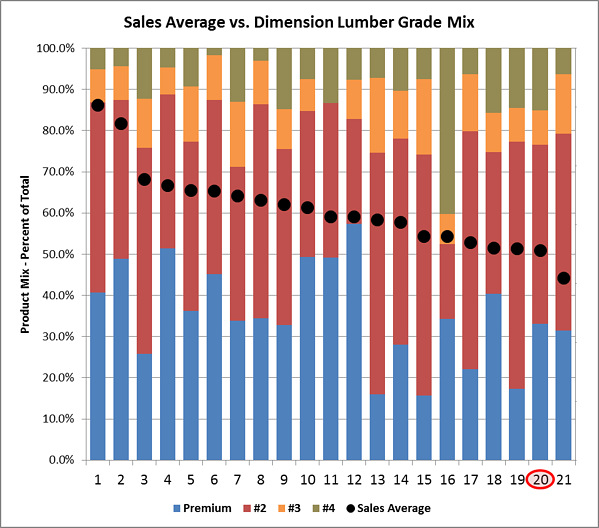 As the chart illustrates, mill #20 has a low lumber sales average, but the mix of products is comparable to some mills that are performing much better. 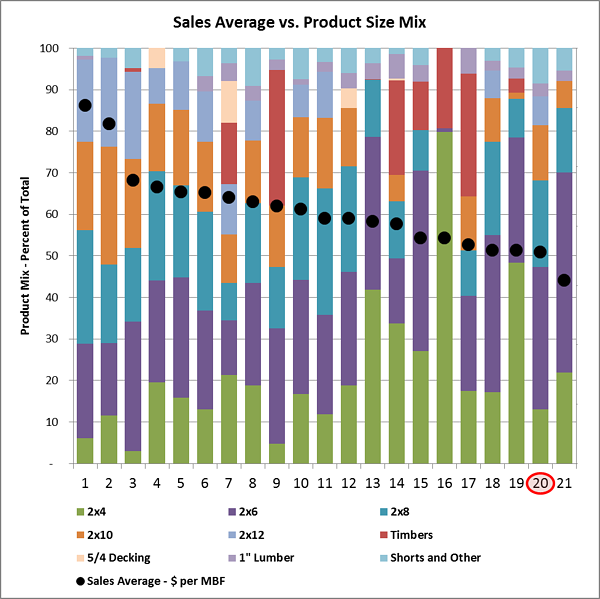 For example, mills #8 and #10 both produce a similar product size mix with a strong focus on dimension lumber and similar proportions of narrow and wide dimension lumber, but they achieve much better sales averages. 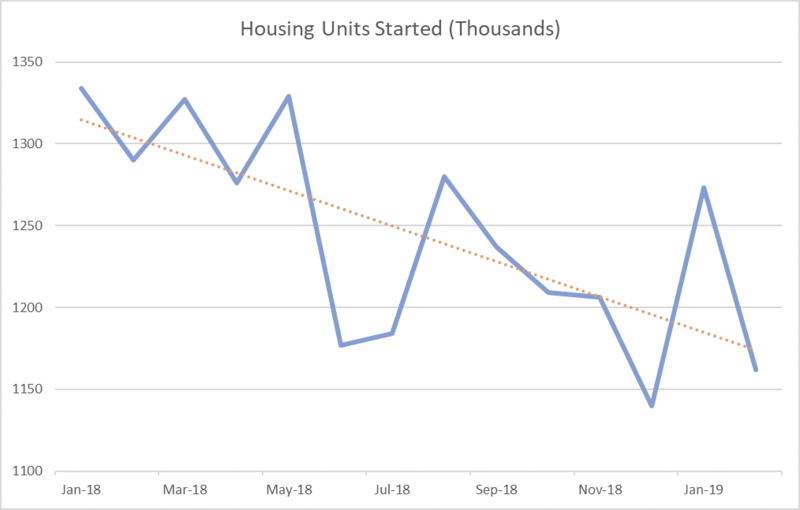 So, the mix of product sizes is likely not mill #20’s primary reason for its low selling average, and it therefore doesn’t represent its primary opportunity for improvement. As noted above, grade yields are another important driver of lumber sales averages. The chart below compares the same set of mills, this time illustrating the mix of lumber grades specific to their dimension (2”) lumber products. Focusing again on mill #20, we can see that while the operation produces a respectable proportion of premium items, the amount of low grade (#3 and #4) lumber is substantially higher than most other mills. Specifically, comparing mill #20 to mills #8 and #10 again, which have a reasonably similar mix of product sizes, shows us just how significant the opportunity for improvement is. While mill #20 is producing more than 23% low grade lumber, mills #8 and #10 are generating only 14% and 15%, respectively. With the knowledge that grade yield improvements represent a key opportunity for boosting mill #20’s performance, its management team can focus on likely causes of downgraded lumber such as drying and manufacturing defects, mis-grading, failure to trim for value at the planer and log quality control issues. If a mill’s sales average is sub-par and grade yield or product mix does not appear to be the problem, the company’s sales strategy and customer profile should also be examined as a next step. With the appropriate detail in benchmarking data, a sawmill management team can move quickly from identifying a broad area of opportunity to a focused set of actions that can drive improvement and improve profitability.